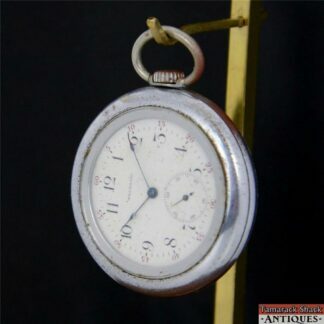 For your consideration is this 1906 Waltham 18s 17J Model 1883 Grade 85 pocket watch movement. This is for an open face case (pendant at the 12) and is a stem set movement. This is for parts or repair. This watch movement doesn’t run. The balance staff is broken. Notes: This is for parts or repair. This watch movement doesn’t run. The balance staff is broken.